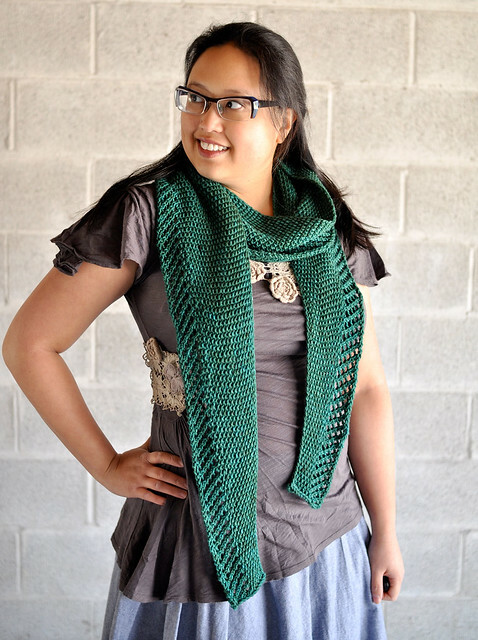 Socks that Rock is back in stock at lettuce knit! *Lots* of Socks that Rock. 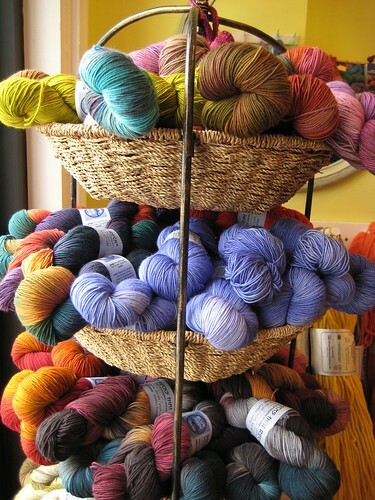 We also got a few other Blue Moon Yarns – Silkie, Silk Thread, Geisha and Laci, all in Raven clan colours. Call (416)203-9970, email, or come in to order! We do lots of mail order (including to the U.S.) and it’s going to go fast! But I’m not so sure about it. 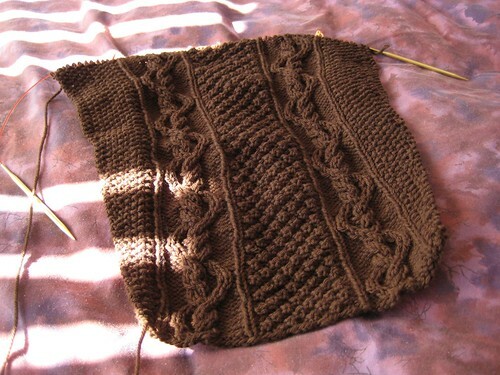 It seems really wide, for one – and the pattern increases the sleeve by 12 more stitches! I left those off, planning to just add them in when I cast on for the yoke sections. But it still seems so big and bulky. I don’t know, I suppose this is going to have to have a time-out for awhile. 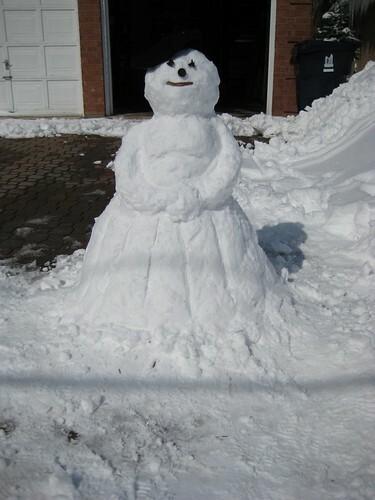 Apropos of nothing, here’s a jaunty snow woman that my sister and I built in the driveway (mostly to use up snow from that last big storm, and therefore less shoveling). Ooh! Thanks for the heads up about the STR. Love the snow(wo)man too. I haven’t made one in ages! 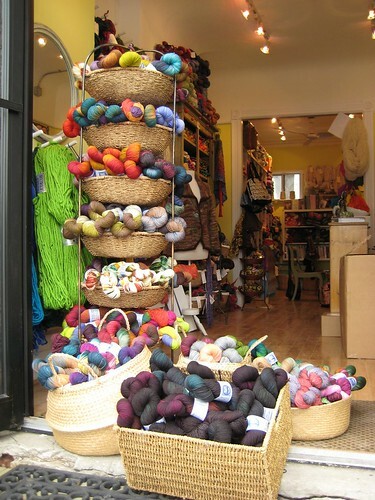 Do you get inspiration being surround by all the variety of yarn? Does it tempt you, or are you immune to it? The snowgirl is great! Do you ever just lay the yarn out on the floor and roll around in it? I might need to wander down to the store at some point on Sunday. The gored skirt on your snow woman made me laugh! That’s quite possibly the most successful snow woman I’ve ever seen- that is to say, it actually looks like a snow woman. All my attempts quickly degenerate into lumpy phallic symbols no matter what I try to build. but will there be any left when I get tomorrow?! good god girl save me something. something good and fine and fuzzy and blue moony…..I don’t want to miss it all. And Andrea we don’t get immune, and as far as the rolling in it….whats done in the yarn store..STAYS in the yarn store. I’d love to have some more sock yarn! I’ve seen so many wonderful Socks that Rock items that aren’t socks that it just feels more versatile than other sock yarns! Wow! @ STR you know I don’t have any of that!